William (Bill) Ramsey, from a young age, had been suffering from brief periods of behaviour that many described as ‘animal like’ normally these bouts would also be accompanied by an unusual smell. On one occasion, Bill’s parents witnessed him rip a concrete post out of the ground and smash it directly in-front of them – this was the most severe incident during childhood, other bouts being more mild in comparison. 22nd July, 1987 – Bill picked up a local prostitute and drove her to Southend Police Station, where he demanded to officers that he be locked up for the safety of the public. The Police officers, looking further into Bill could find no criminal history, so were reluctant to arrest him for no real reason. Suddenly, Bill began to growl and snarl like a rabid animal at Duty Sergeant Terry Fisher, Bill then grabbed Fisher by the throat hoisting the 6ft tall, 14 stone policeman into the air and then launching him across the car park. Another police officer was scratched in the altercation, it ultimately took six men to finally restrain Bill who had not gone down without a struggle reportedly throwing officers ‘like matchsticks’ across the station car park. Safely locked up into a cell, officers began to recover from the struggle only to hear a loud bang coming from within the cell block. Bill, incredibly, had smashed through the re-enforced hatch in his cell door with his head and arm stuck through, PC Tony Belford stated ‘I’ve never seen anything like it before or since, to see a human being doing things like that’. Police had to sedate Bill, he required a dose nearly three times the amount of an average person to calm him. The Fire Brigade then had to be called to cut Bill out of the cell door. Ed and Lorraine Warren are highly regarded as the most prolific paranormal investigators in the world, handling a number of high-profile paranormal cases that have inspired countless movies, books and documentaries. Lorraine Warren discovered the story of Bill Ramsay from an american documentary covering the case, she concluded that Bill Ramsey was suffering as a result of a demonic possession. Lorraine convinced Ed, who at first was skeptical (he later wrote an entire book on the case), to make contact with Bill to provide assistance. 28th July, 1989 – Bill had travelled to Connecticut USA, to meet with the Warrens. He was eventually taken to Our Lady of the Rosary Chapel, in which a bishop (accompanied by the Warrens and two armed guards) conducted an exorcism on Bill Ramsey. As the exorcism commenced, Bill began to ‘turn’ with witnesses and photographs clearly detailing Bill having to be physically restrained whilst his hands and body contorted as he growled at the bishop. When Bill eventually came round, he was exhausted and covered in sweat – however, since that day he has never experienced any such behaviour again. Whether a case of lycanthropy, or genuine demonic possession, these events have left many individuals perplexed and disturbed. Its association with the Warrens certainly gives the case a lot more credibility, and it is regarded by many as the only true modern-day case of a ‘werewolf’. Halloween is fast-approaching, and if you’re fan of the spooky season then there is no better time to start planning what to do than now. Fright Nights, Scream Parks, Halloween Events, and Pop-Up Attractions will appear in their droves in about three months time, with the selection increasing each year. However, there are some other alternatives which we delve into below along with a few of our insider top tips to ensure a truly memorable and safe Halloween. What’s a home haunt? Well, it’s exactly what it says on the tin. These are haunted experiences that people host at their homes (normally in their front garden or garage). 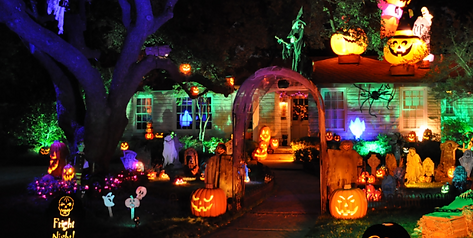 A bit like those incredible house displays at Christmas with lots of lights, but instead they decorate their homes with smoke, tombstones, lights, and pumpkins to create a Trick or Treat paradise (or nightmare). Normally, they are run for fun as the home owner just loves Halloween, sometimes a charity is selected with proceeds of a small ticket fee going to help raise much deserved cash. Either way, they are great fun for the whole family and help get everyone in the spooky spirit (pun intended). Home Haunts are now growing in popularity in the UK, with more popping up each year – so why not go along and support your local home haunter? If you do not have one, then why not start one yourself? Either way, it is fantastic fun! – No Queues, unlike the large events where you will spend the majority of your time standing in a queue – permanent attractions mostly operate on a time-slot entry, so you just book a time then turn up and walk-in. 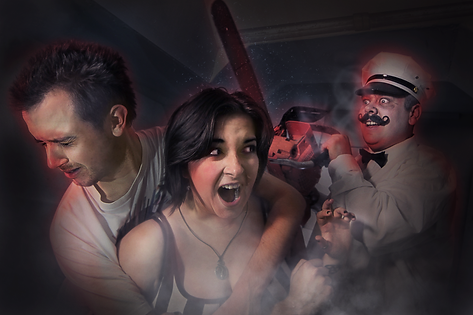 – They’re Indoors, that October weather isn’t famous for being hot and dry, so a permanent indoor scare attraction will save the worry of your Halloween celebrations being ruined by the British weather. – Better Connected, permanent scare attractions are normally located in town and city centres, so are a lot easier to commute to on public transport. It also means if you want to continue the Halloween celebrations at a local bar, restaurant, casino or club…you can, with ease! – More Choice, as they are normally open 7 days a week, unlike the big pop-up events that run for select nights. Meaning if you work a night shift, or have to look after the family pet in the evening, you don’t have to miss out on the celebrations, yipeee! – Book Early! A lot of Halloween Events, Fright Nights and Attractions, offer Early Bird discounts if you’re open to booking several months in advance. So be sure to follow their social media channels, and get those tickets booked early to save £££. – Visit Early! It may seem simple, but visit the events early October when they’re quieter (tickets are often cheaper as well), you will spend less time queuing and more time being scared. Alternatively, visit one of the year-round attractions that work on time-slot entry, and avoid the queues entirely. – Back to Front! If visiting one of the Halloween Events, Fright Nights or Scream Parks, get there for opening and head straight to the furthest attraction away – then work your way back to the front of the event. Normally people will go straight to the nearest attractions, meaning long queues at the front half of the event at the beginning then long queues at the back half near to the end. Alternatively, visit one of the year-round attractions that work on time-slot entry, and avoid the queues entirely. – Dress Appropriately! If you’re visiting an outdoor event, do dress accordingly – the weather can rapidly change in October, with downpours and strong winds a high possibility. Alternatively, visit one of the year-round attractions that are located indoors. – Immerse Yourself! Like reading a book, the words and content may be there, but it involves your imagination to really succumb to the fear of it all. So switch off and allow yourself to be overcome with fear, you’ll have a much better time than those that do not. So that’s a wrap on another Hide and Shriek blog, we hope that it has proved insightful and helpful in planning your upcoming Halloween. Don’t forget, we are open year-round, and with us being the only Scare Attraction ranked in the Top 5 Activities in Essex on TripAdvisor, you are assured to have a frightfully good time with us. So if you haven’t visited before, why not click here and book your tickets to one of our terrifying experiences today? The views and opinions expressed in this article are those of the author and do not necessarily reflect the official policy or position of Cowscorge LTD (trading as Hide and Shriek).